The Yellow-shouldered Amazon (Amazona barbadensis) is a beautiful parrot that has found a special place in the heart of many Bonaireans. Also known on Bonaire as the lora, it can be seen flying around the island or sitting on top of a large cactus. It has a bright yellow head with a white forehead and green plumage. It is often confused with the Brown-throated Parakeet (Aratinga pertinax) but can be identified by several distinct features: 1) it has a much shorter tail than the parakeet; 2) it is larger than the parakeet; it measures on average 35 centimeters (~13.8″) while the Brown-throated Parakeet measures on average 25 centimeters (~9.8″); 3) it has distinct yellow shoulder patches after which it gets its common name; and 4) it has a small red patch on its wings. The Yellow-shouldered Amazon has a limited and distinct range with genetically isolated populations in Bonaire and Curaçao as well as northern Venezuela and the Venezuelan islands of Margarita and La Blanquilla. 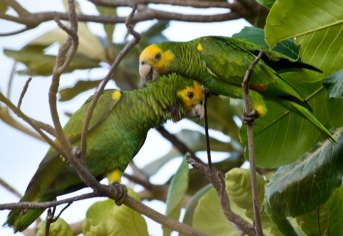 Bonaire has a globally significant population of Yellow-shouldered Amazons, locally called the Lora, which breed on the island between March and August. The female lays three eggs in a nest built in a tree or cliff hollow, and incubates them for 26 to 28 days. Once hatched, chicks remain in the nest for two months before fledging. After they fledge, the chicks stay in family groups for several more months. Yellow-shouldered Amazons form long-term monogamous pairs, which is an unusual trait for birds. The Yellow-shouldered Amazon has been the focus of many conservation efforts on Bonaire as this parrot is globally and locally endangered. The IUCN Red List classifies it as Vulnerable; its global population is estimated to be less than 8,000 individuals. Yellow-shouldered Amazons are highly valued as a pet and many young are taken from their nests and sold illegally. Even though they are protected by island legislation, Yellow-shouldered Amazon chicks are still being poached from nests on Bonaire. Echo, a nonprofit organisation for parrot conservation on Bonaire, has been studying the Lora’s life history. Echo is also involved in outreach to increase local awareness and is dedicated to a reforestation program at Dos Pos. 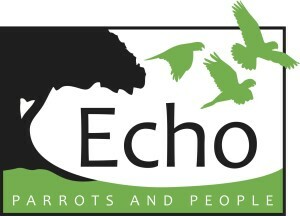 To find out more about echo please click on their logo below.